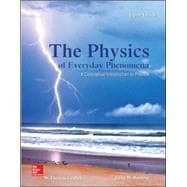 The Physics of Everyday Phenomena, Eighth Edition, introduces students to the basic concepts of physics using examples of common occurrences in everyday life. Intended for use in a one-semester or two-semester course in conceptual physics, this book is written in a narrative style, frequently using questions designed to draw the reader into a dialogue about the ideas of physics. This inclusive style allows the book to be used by anyone interested in exploring the nature of physics and explanations of everyday physical phenomena. Beginning students will benefit from the large number of student aids and the reduced math content. Professors will appreciate the organization of the material and the wealth of pedagogical tools.